Frederick William “Fred” Hammond was born on the 27th December 1960, in Detroit, Michigan USA. He is a gospel singer, songwriter, and player of the bass guitar, who is probably best known for being a former member of The Commissioned, a gospel group. He is also recognized for being a record producer, the founder and CEO of Face to Face Productions. Besides that, he is the founder of his own record label Hammond Family Entertainment. Have you ever wondered how rich Fred Hammond is, as of mid- 2016? According to authoritative sources, it has been estimated that Fred’s net worth is as high as $500,000, which has been accumulated through his successful involvement in the music industry as a gospel singer and record producer. Fred Hammond is the son of Mildred Hammond; he was raised with two brothers in a church-going family in a neighborhood where religion and music were very dominant. So, from an early age, he was interested in music, and when he was 17 years old, Fred started to attend bass guitar classes. After he matriculated from high school, he served in the US Army together with friend Michael Jones, and when they discharged, they began their careers in the music industry. Fred`s music career began in the early 1980s, when he became a member of the gospel group The Winans; however, he left the group, and joined another gospel lineup called The Commissioned, one of the six founding members alongside Keith Staten, Mitchell Jones, Michael Williams and Karl Reid. Their first album came out in 1985, entitled “I’m Going On”, reaching No. 11 on the US Billboard Top Gospel chart, and so encouraging the band to continue working on their music. The second album came out the following year, entitled “Go Tell Somebody”, which reached No. 2 on the US Billboard Top Gospel chart – the sales of the first two albums increased Fred`s net worth by a large margin. He stayed with the group until 1994, as they releasedsix more albums, including “Will You Be Ready?” (1988), “State of Mind” (1990), “Number 7” (1991), and “Matters Of The Heart” (1994). However, Fred returned to The Commissioned in 2002, releasing two more albums with the group, “The Commissioned Reunion Live”, and “Praise & Worship” (2006), which also added a lot to his net worth. Meantime, he started a solo career, founding a group on his own, entitled Radical For Christ, with which he has released four albums, including “The Spirit of David” (1995), “The Inner Court” (1995) and “Purpose By Design” (2000), all of which have added to his net worth, as the albums have been sold in tens of millions all over the world. Furthermore, Fred has also released several albums as a solo act. His debut solo release came out in 2001 entitled “In Case You Missed It….And Then Some”, followed by the release of albums such as “Free to Worship” (2006), “Love Unstoppable” (2009), and his latest release “I Will Trust” (2014), increasing further his net worth. 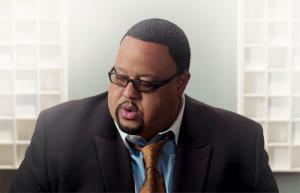 Thanks to his skills, Fred Hammond has won numerous prestigious awards, including a Grammy Award in the category Best Contemporary R&B Gospel Album for “Free To Worship”, and Stellar Awards in the category Male Vocalist of the Year for the work on album “Purpose By Design” by his group Radical For Christ, among others. Speaking about his personal life, Fred Hammond was married to Kim Hammond from 1986 to 2004; they are the parents of two children – one of whom is adopted. 1 In 1993, I had a vision. I saw the Lord seated on the throne and at his left hand was a vault. He opened the vault and inside were songs. And the Lord said to me, "These are my favorite songs. These are the songs that minister to Me and bless my people. And I will pour them out into the earth... some to you and some to others. Watch what I will do. 1 Has one daughter BreeAnn with his ex-wife Kim, and adopted a boy named Darius a.k.a. "Bubba.". 2 When he started Commissioned, the group consisted of 6 members; 3 singers (Karl Reid, Keith Staten & Mitchell Jones) and 3 musicians (Fred Hammond, Michael Williams & Michael Brooks.) Fred doubled as a musician and singer; playing bass and singing at the same time. Michael Brooks was the Keyboardist and Michael Williams, the drummer. Eventually, Commissioned took on two extra musicians to tour with them. Brothers Earl Wright (Keyboards) and Michael Wright (Guitar). Keith Staten and Michael Brooks left the group in 1990 and 3 new members were brought on. Marvin Sapp took Keith's place as a vocalist and Maxx Frank & Eddie Howard Jr. became the Keyboardist and Organist for the group. (bringing the group 7 Members) After Eddie Howard left the group, Fred brought on two more keyboardists for the group's live performances; Producers Tommie Walker and Noel Hall. After Fred left Commissioned in 1995, Tommie Walker and Noel Hall went with him to become apart of Radical for Christ. Noel Hall served as Fred's musical director for 6 years as well as song writing and producing. Tommie walker played Aux keys and worked alongside Fred Producing and song writing as well. 3 His last name Hammond, is his adopted name from his step-father Raymond Hammond. Before his birth, his mother Mildred was married to another man and became involved in an extra-marital affair which lead to her pregnancy with Fred. Her first husband left her. On a Radio show with Donnie McClurkin, Fred revealed that his mother had shared a dark secret with him before her death. After her first husband left her, she attempted to have Fred aborted. In 1960, she went to an illegal abortion clinic and had the procedure done. When it failed, she informed the clinic and rescheduled an appointment to "correct mistake." After a failed second attempt, she took this as a sign from God that this baby was supposed to be born and left the clinic. She gave birth to Fred in 1961. Some time after he was born, she married Raymond Hammond and gave birth to two sons Raymond Jr. and Dave. Raymond Sr. died of bowel cancer at the age of 32, when Fred was only 8 years old. 4 For each album that he has recorded, Fred laid down the bass tracks for most of the songs himself in the studio, but for live performances had another bass player. 5 He has won 6 Dove awards, 4 Stellar awards and one Grammy. He was been nominated 19 times for the Stellar Awards, 12 times for The Grammy's and once for the Soul Train awards. I'm in Love with a Church Girl 2013 writer: "Forever I'll Praise"
The Second Chance 2006 performer: "I'M GLAD ABOUT IT" / writer: "I'M GLAD ABOUT IT"
The Gospel 2005 performer: "All Thing's Are Working The Gospel Remix" / writer: "All Thing's Are Working The Gospel Remix"
Left Behind: The Movie 2000 Video performer: "Can't Wait for You to Return" / writer: "Can't Wait for You to Return"
2015 Image Award Image Awards Outstanding Gospel Album (Traditional or Contemporary) Album: "I Will Trust"